Visiting the San Diego Zoo this past August was one of my favorite memories of the summer. While strolling and enjoying the spectacular animal kingdoms, I was particularly drawn to the zebras. I was struck by both their likeness as well their differences. Although at first glance, they appeared the same, up close and personal, they were in fact, unique. 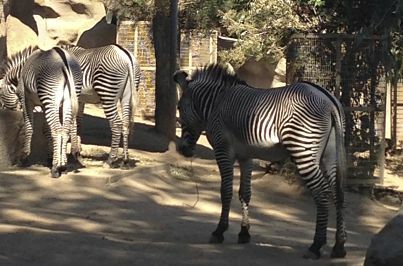 I since learned that while their general patterns are similar, there are no two sets of zebra stripes exactly alike. It got me thinking about people. We too, are truly unique. No two blueprints alike. If given the same task, we would all probably approach it differently, even if it yielded the same results. Each of us have our own core competencies, values, and personalities that navigate us through our lives. That’s what makes the world go ’round. Unfortunately, the Zebra’s markings are fixed. Like the expression suggests, “a zebra never changes its stripes.” They are stuck with them, forever branded. This reference suggests the “inability to change,” and implies that a person’s personality flaws are not likely to shift. Of course, a contrary belief is that all of us have the ability to surrender an unfavorable trait or two, and change. And I’m a believer. No one is born with bad habits, they are learned. Therefore, they can be unlearned through change and with the passage of time. At least, it is possible. In this regard, let’s talk about two kinds of change; willful and passive. The willful aspect of change is acknowledging the need and aligning it up with intent to pursue. When our life isn’t working, we generally feel the warning signs (pre-contemplation). There is a moment of clarity (contemplation). We react with a deliberate consciousness to act on these instincts (w/preparation and action plan) as we change something, anything. It can simply be empowering enough to recognize that we can. And yet, even if we are happy with the status quo, we still continue to evolve in a very organic way. Some of us may not even realize that we have changed our “stripes” until we look back from where we came. As we mature, we “grow” into change. This is a more passive and natural process of change, but change, nonetheless. However change emerges, one thing is quite clear; Making a lasting change in behavior is rarely a simple process, and usually involves a substantial commitment of time, effort and emotion. So when we consider the possibilities for personal change, let’s think about the Zebra. Appreciate that we have options to change our “stripes,” because we can. Anytime. It’s a choice. The real question is…do we want to? I remember visiting the San Diego zoo years ago and loving it. There’s something so fascinating about watching animals….noticing their beauty, their habits, their ways of being with each other and their environment. As I read your post, I also thought that like Zebras, perhaps we aren’t able to necessarily change our outer self, but there is the ability to change internally. And even in the most basic of ways, we change each day simply by aging. I love the distinction you made about willful vs. passive change. That acknowledges that change happens and we have a choice in how we participate.